All transactions are safe and secure with a reliable history in online purchasing behind each of our associates. 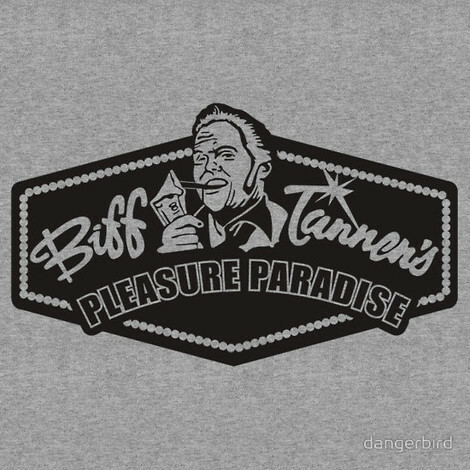 Buy the Biff Tannen's Pleasure Paradise t-shirt to own Back to the Future clothing and merchandise. The design on this tee displays a cool tribute to the second film in the Back to the Future trilogy. The design reveals a logo for Biff Tannen's Pleasure Paradise, the casino and hotel that he built with his winnings from being given the sports almanac by his older self. Along with the hoverboard skateboard, it was first seen in the BTTF Part 2 movie. Marty McFly and Doc Brown time travel to a retro-futuristic version of 2015, an alternate 1985 and the main setting of the first film in 1955. Order these Back to the Future shirts today with a toy DeLorean car. In addition to the Biff Tannen's Pleasure Paradise tee above, browse the Back to the Future Clothing Gallery for more apparel like men's and women's clothes, kids shirts or hoodies.